Prologue: This is – for a change – not about A and me, it is about my friends and me traveling to Vegas, having a wonderful, well deserved birthday vacation with some memorable episodes. In December 2008 I celebrated Christmas with my mom’s extended family in L.A. and San Francisco. I had my big brother flown in from Vienna and we spent all of our time and money on clothes. We bought massive amounts of clothes, to the extent that both our suitcases were at least 10 pounds overweight. But that’s not all we did, in fact we also went to Vegas together and wandered through the city of sin. One night, I was already in my jammies, my brother asked me to go downstairs with him, to check out some of the casinos. I hesitated, I was way too comfy in my comfy pants but he said, no one would notice, we should just go for it, and so we did. My brother introduced me to roulette and gave me tips on what to do and what not to do. We spent the entire evening gambling together, but neither of us did it for the game itself, we just sat beside each other and talked about what had happened in the last 8 months, the last time I had seen him. One night my brother and I were wandering up and down the Vegas strip, my brother had the glorious idea to celebrate my next birthday in Vegas together. He said he would come with some of his friends, I should fly in some of my friends and we would have a blast. It’d be legit and just unforgettable and just amazing overall. He said it would be fun to go skydiving and see some shows and just celebrate. The idea quickly manifested in my head. The day I went back to DC and he went back to Vienna, I reminded him of his promise and he again reassured me that we would see each other in a few short months back in the city of sin. I asked my best friend C from Vienna to come and celebrate my birthday with me. Much to my surprise, she agreed within seconds, she only asked me when to be where and a few weeks later, there she was. She only packed clothes for about 3 days, she said, she was planning on going shopping-crazy and so she did. She seriously went crazy, it didn’t matter where (DC, NYC, Philadelphia, Vegas…) or when (from dusk til dawn), there was always a big bag in her hand, with her newest edition of tops, dresses, sunglasses, bags and what ever else she could find, it was a delight watching her go consumeristic crazy. A week later we were on our way to Vegas. The flight was delayed, but we were so excited, we didn’t care in the least. We had booked a hotel room at the Planet Hollywood and had the entire week planned out with shows and activities and of course – shopping. We couldn’t wait for all the fun, we could barely sleep (mainly because of all the noises from outside), so we got up super early the next day, just so we wouldn’t miss a single minute out of our fun-planned-week. For everyone, who likes the thrill but also some sense of being safe, this is perfect for you. 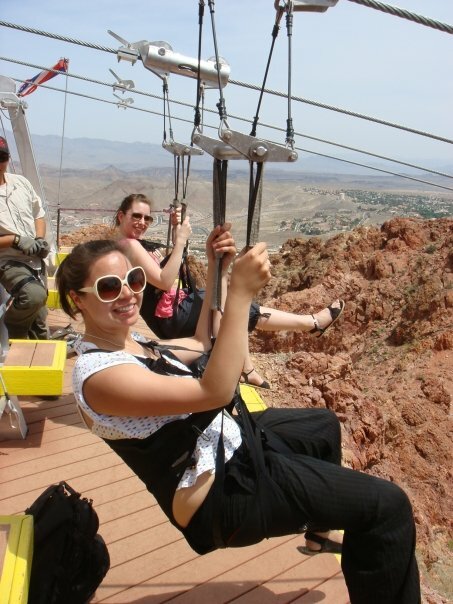 It was breathtaking, not only do you go about 60 miles an hour, you get to enjoy an awesome view and all of that while sitting in a safe and secure harness. Practically the safest way of traveling, a little impractical if you consider all the wires, but aside from that, a lot of fun and definitely a do-again! That evening C and I went to see the blue-man group and it was just simply breathtaking. But fear not, not everything that glitters is gold. 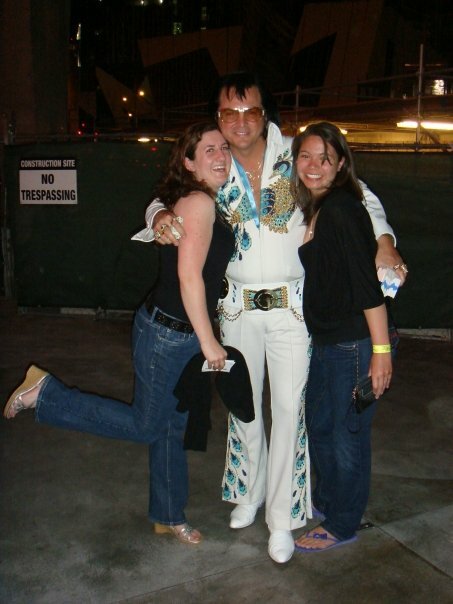 The next evening we spent watching a drag-queen-show with my friend Ams, I have to admit I do not really recall much of that night, other than an Elvis-imitator taking a picture with me, but I am not sure that actually took place at the same place as the show. I believe it was that night Ti arrived as well. The stories between Ti, Ams and me differ wildly. 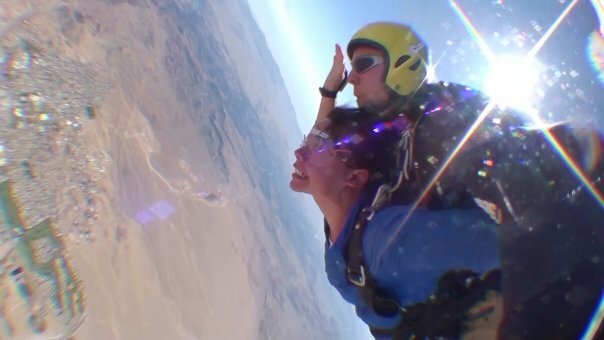 The fact is: we all jumped off the same airplane, but I for my part was fearing for my life, all the while we were free falling, wondering how I could get back into the airplane. I was in a state of shock, a state, that in fact is not describable, while Ams and Ti absolutely loved it. They had the adrenalin rush, excited and just super giddy, while I was close to crying. Would I do THAT again? Probably not, unless one day I feel the need to have another near-death experience.